"Choose a job you love and you will never have to work a day in your life"- a quote that everyone tries to live by, but few actually succeed. Luckily, that is what happened for Sweet Team Chef Joan Repato, whose love for cooking has spanned decades. "My mom and my oldest sister inspired me to cook and bake." "My mom and my oldest sister inspired me to cook and bake. My mom baked fresh bread, cakes and pastries during the weekend and she would show us how to help her. My mom is "super mom"; she raised 5 children, was a full-time registered nurse, sewed clothes for us, cooked and baked everything from scratch. That’s why I’ve been baking and cooking since I was 10," said Repato. Those experiences inspired her enough to turn it into a career. Repato has been in the industry for over 25 years. She graduated from culinary school in 1988, but went back to school to study professional pastry in 1991. She has worked as an On-Board Executive Chef for Lindblad Expeditions, a Pastry Chef for NCLA (Norwegian Cruise Lines- America, based in Hawaii), was Chef Manager and Director for a food service management company, was a Sales Rep and Product Specialist at Marque Foods, and now also works as the Dreidoppel Technical and Sales Advisor for the US market. 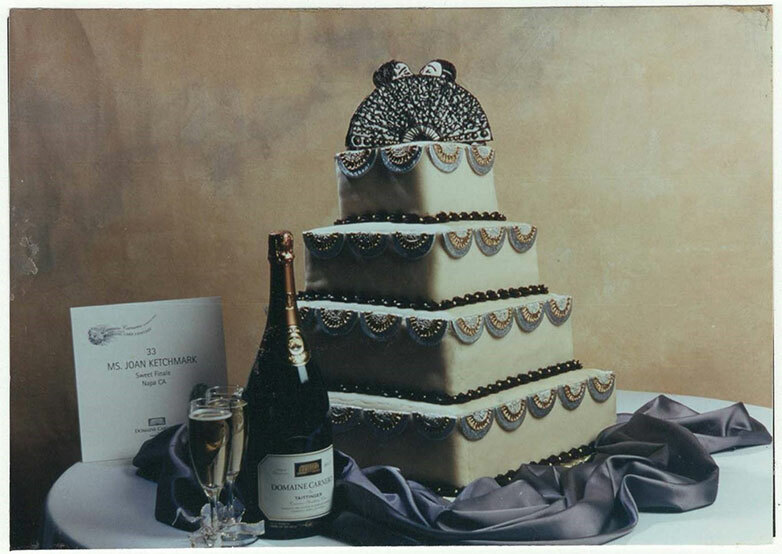 One of her fondest moments in the industry is when she was a finalist at The Domaine Carneros Ultimate Wedding Cake Competition in 1996 in Napa Valley, where she was in the final 40 competitors out of a total of 800 participants. "The theme of my wedding cake was Art Deco and I got my inspiration from Erte [an artist] by creating the top of the cake based on Erte’s jewelry piece, which is a man and woman kissing behind a fan. I created the whole piece out of white and dark chocolate," said Repato. Above: Chocolate Grand Marnier cake with Toasted Almond Joconde cake filled with chocolate ganache and Grand Marnier buttercream, covered with marzipan decorated with gold and silver gold art deco and topped with dark and white chocolate fan with Man & Woman Kissing. In 1994, she opened her own business called "Sweet Finale" which focused on retail, catering, and wholesale. She owned and operated the pastry business for over 12 years in Napa Valley. Through all of her time and experience in the industry though, she does not limit herself to a signature dessert. "I don’t really have a signature dessert, I love making it all. I am constantly thinking of what I can do with Dreidoppel’s flavor pastes and I like to stay on top of the trends. My latest obsession is brush strokes (shown below on elderflower cake). I also really like working with chocolate, buttercream, and fondant," said Repato. 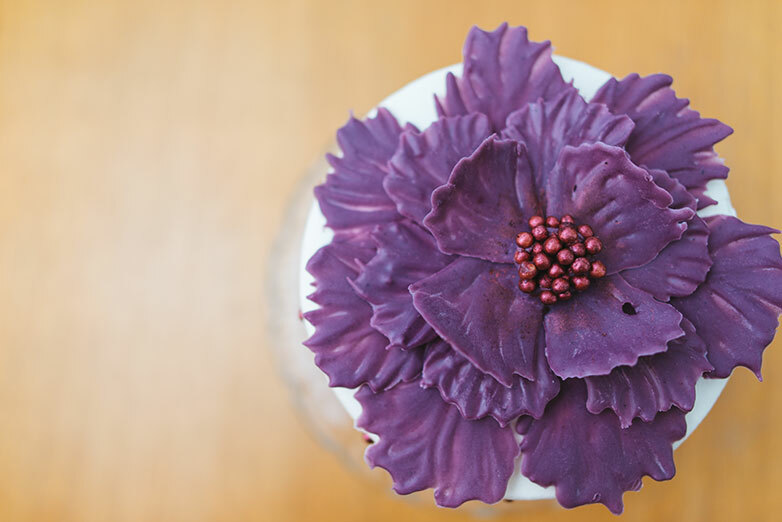 Above: An example of Joan using the brush strokes technique with white coating chocolate to create flower petals on an elderflower cake. "Tasting, eating, and creating desserts with chocolate from around the world is my favorite part of being in the industry. As a sales rep, I find joy in helping my customers find the right ingredients and decorations to make their cakes and pastries taste great, and look awesome," said Repato. "There are new techniques coming out all the time, where you find out a way to use certain things you usually wouldn’t think of in order to achieve something. Like using an actual paint brush for brushstrokes with chocolate or using bubble wrap for creating honeycomb (melt chocolate, spread it on bubble wrap, then peel it off for a perfect honeycomb design)," said Repato. "In the future, I see a lot more use of floral flavors and spices from around the world because of our global connectivity, such as Rose, Lavender, Elderflower, and Cardamom. However, I think that mashups like sweet and savory will continue, as well as nostalgic desserts." "My advice to culinary graduates is you must have passion to create wonderful, delicious food. Be passionate about whatever you decide to do in life. Some students get into the culinary industry thinking they want to be a celebrity chef and make a lot of money. It is possible to make a good amount of money in the field, but that should not be the main reason you want to make this a career. You must have passion and desire. Out of the 30 students in my class in culinary school, I am the only one still in the industry. I use my passion to create new desserts with the products we offer and my sincere desire to help our customers, helps me be successful," said Repato. So what is Repato’s philosophy for being successful in the industry? "Keep things simple, easy to produce, delicious and look amazingly scrumptious!" Melt white coating chocolate, color with ChocoButter (or I colored that flower [see image above] with Dreidoppel cherry flavor paste and balanced water content with cocoa butter). Paint petals on parchment paper and lay it on a petal form (you can cut the cardboard center of paper towel in half lengthwise and use this as a homemade petal former). Allow chocolate petals to set in a cool place or in the refrigerator. Peel off parchment paper and shape into a flower.